By installing point-of-service payment processes, healthcare organizations can accelerate the revenue cycle. Hospitals and healthcare systems today have their revenues squeezed by a number of different factors, including shrinking patient volumes and decreased philanthropic giving. With these financial factors also taking a toll on providers, it is more important than ever for these entities to make sure they are efficiently collecting the money they are owed for treatment and services performed while maintaining and enhancing patient relationships and satisfaction. An area ripe for improvement in many healthcare organizations is the collection of the self-pay portion of payments, the out-of-pocket part of patients’ payments that falls outside of their insurance coverage, or the total payment for the growing number of uninsured consumers. Today’s economy has caused consumer responsibilities to change. Consumers now have a greater financial risk associated with medical treatment as demonstrated by higher copays and deductibles. Also, according to a Healthcare Informatics Webinar, increased consumer financial responsibility does not equate to higher revenues for healthcare providers. To translate increased consumer financial responsibility into faster payment collection and avoid potentially decreased revenues, providers need to increase the ways and means of collecting payments from consumers, both in-person prior to treatment and online after treatment. By improving the point-of-service process, providers may be able to reap more tangible financial benefits. The increased need for point-of-service payments can be tied to the providers’ desire to receive payment prior to treatment, along with other trends such as a greater number of immigrant and uninsured patients who pay out of pocket, a growing contingent of companies that bypass their insurance providers and pay directly for their employees’ healthcare needs, and the increased use of high-deductible health plans and health savings accounts. • debit and credit card payments with real-time authentication. And a surprising fourth one: payroll deductions for employees, one of any healthcare facility’s largest constituencies. To accept these point-of-service payments, providers need to have specific hardware and software in place. Electronic payment processing requires devices attached to workstations for swiping credit and debit cards and check scanners that convert checks to electronic transactions. To process cash payments, virtual cash drawers, department vaults, vault aggregation bank deposits, and cash reconciliation, including management and recording of over/shorts, are necessary. After accepting payment from patients, the point-of-sale system submits payment information in posting files for both the patient accounting and general ledger systems so that all activity is automatically prepared for direct input. Point-of-sale information is also available for reporting and reconciliation processing for researching transactions, making adjustments, balancing bank deposits, and reconciling accounting systems posting files. Administrative features, such as creating departments and cost centers and reviewing inventory if used to handle nonpatient payments, give hospital management the ability to monitor user activity. Cash payments can be a real headache for healthcare facilities because cash must be manually handled, counted, and deposited. Cash registers for payments in retail environments are generally expensive and focused on higher volume transactions—something most hospitals do not require. Increased emphasis on the self-pay portion of bills places greater demands on cash-handling best practices, such as sufficient separation of duties. Utilizing a user-specific real or virtual cash drawer system with master vaulting to track monetary assets, starting from the moment of receipt of cash to bank deposits, ensures that payments cannot be lost, misplaced, or stolen. To protect the security of cash payments, providers will install more safes, placing them out of public view and bolting them to the floor. Credit card and check payments that can be converted into electronic transactions are both easier to deal with at point-of-service locations than cash. Electronically capturing card and check payments reduces “float,” speeds the inflow of funds to the bank account, and simplifies the entire deposit process. Card swipe and check reader machines process credit card payments instantaneously and convert paper checks into electronic transactions for transmission through the automated clearinghouse network. Offering patients multiple payment methods, including deductions for hospital employees, makes the point-of-service process more like other commerce transactions that are well known by consumers. Payroll deduction is an interesting point-of-service payment process because serving employees is big business for providers. It’s generally known throughout the industry that healthcare workers are among the biggest consumers of services because their familiarity with how to take proper care of their health leads to more demand. Setting up payroll deductions from the point of service to support this demand involves verifying employee eligibility and creating payroll deduction orders that are fulfilled either once or on a recurring basis. (Recurring deductions need to be sensitive to payroll cycles.) A maintenance method also needs to be implemented to create alerts about payroll changes that affect how automated deductions are executed. Benefits for this service touch many aspects of an organization, including streamlining payment processes, improving customer satisfaction, assisting with fundraising, and reducing systems training. • reduced transaction service time by handling cash, cards, checks, and employee payroll deductions, including the conversion of eligible checks into electronic transactions. 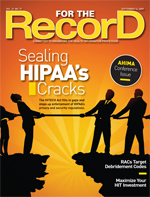 A point-of-service system streamlines payment processing by standardizing the process and reducing the rekeying and rehandling a payment receives as it moves through deposit and posting—a major plus for multifacility healthcare organizations that may have had disparate collection processes. Accepting patient payments for any location creates additional collection opportunities. An ideal point-of-service system gives providers knowledge of whether a patient has unpaid bills at another facility and also provides a way to handle interorganization transfers. For example, cash collected at Facility A for Facility B would be deposited at Facility A. Later, an electronic funds transfer would debit Facility A, credit Facility B, and produce the remittance advice in Facility B’s posting file. Accepting interorganization card and check payments is somewhat easier to achieve because they can be electronically deposited into a Facility B account without an additional interorganization transfer. In each case, balance controls need to keep track of the transaction movement in order to properly reconcile activity. Another service finding its way into the point-of-service process is the establishment of financing or payment plans prior to treatment. By creating these accounts ahead of time, providers can accelerate 60 to 90 days ahead of the current billing cycles that wait for adjudication and traditional paper billing to run its course. Processing nonpatient payments has a role as well. Items such as equipment rental fees or class registration can be similar to accepting patient payments except they post to the general ledger instead of the patient accounting system. Accepting nonpatient payments is also useful for processing charitable donations. Some organizations have used a virtual point-of-service system to process donations directly at galas and other fundraising events away from the traditional locations inside the healthcare facility. In addition to organizational benefits, consumers respond positively to improved point-of-service payment capabilities. Take, for instance, refunds that can be processed electronically through the system rather than through a manual check process. Patients enjoy receiving refunds on the spot as opposed to waiting two to three weeks. Implementing a point-of-service payment system consists of setting up the organization records for specific regions, entities, and departments; establishing the general ledger accounts for offsets and over or short entries; and setting up and training users. Implementation can be tackled in phases, such as one facility at a time, to allow for infrastructure changes to be properly supported and absorbed before tackling the next entity. The average cost of an implementation for a healthcare facility depends on the number of terminals purchased. For example, a combination check reader and card swipe device costs about $225, while a card swipe reader alone will cost about $85. Add another $200 per terminal for set-up and system configuration, plus there may be minimum fees and training expenses to consider as well. Removing the analog phone line—which costs about $10 per month—that was used for dial-up credit card authorization terminals can often offset the cost of new devices in two years or less. Meanwhile, the ongoing operation costs consist of maintenance and payment click fees. These fees vary based on hospital size or number of users. Studies indicate a small hospital (approximately 100 beds) can expect a 169% return on investment after three years. A medium hospital (300 beds) can expect a 288% gain, while a larger enterprise can see as much as a 360% windfall. The larger enterprises generate more savings because they frequently have more than one point-of-service payment process that can be centralized. Eliminating the additional redundancy ends up producing more savings. Contributing to the successful return are the following factors: a reduction in the cost of taking payments, reduced training expenses, a decrease in exceptions and back-end processing and, naturally, accelerated cash flow. In addition, there are indirect benefits such as improved customer service and a higher quality of work/life for staff. Moving forward, capturing and handling payments needs to occur in a more structured, streamlined manner in healthcare facilities. Proponents of real-time adjudication want to see the practice incorporated in this area because an adjudicated claim means the self-pay portion is now revealed. Furthermore, if the patient is to be fully empowered to review the financial impact of care prior to treatment, then the current method of insurance claim, adjudication, and settlement is in dire need of reform. This conclusion is not surprising due to the fact that the process is based on an antiquated batch-processing model conceived well before the Internet and the idea of real-time, peer-to-peer communication. In the future, using point-of-service payment collection will be most effective when paired with real-time adjudication and transparent pricing. Lacking real-time adjudication, organizations created their own internal claim databases that forecast the self-pay portion based on the financial outcome of similar treatment. Healthcare organizations that provide reliable prices to consumers prior to treatment know what to collect at the point of service and can subsequently improve on how it is achieved. Doing more with less staff is another concern for finance departments. The economy puts financial departments at a greater risk of staff cuts, especially among hospitals with 500 or more beds. Streamlining the payment process by automating point-of-service transactions and integrating them with other systems saves time and enables organizations to devote manpower to other areas. Organizations must also remember that changing processes at the point of service cuts a wide swath. Be sure to leave enough time to prepare, plan, train, and implement changes. Obtaining executive buy-in is an important step to beginning the path to more efficient point-of-service operations. However, it should be one of the easiest to achieve because of the obvious benefits in expense, control, and operations. Preparing a return-on-investment report can uncover numerous examples of waste that manual procedures have slowly layered into existing processes. Simple items, such as eliminating analog phone lines used for dial-up swipe terminals, all contribute to greater financial success. Obtaining employee buy-in should likewise be easy to achieve. Consider that when an employee can improve customer satisfaction with the healthcare process, then job satisfaction is similarly improved. Surveys taken where customer satisfaction is measured on a formal basis reflect that automated point-of-service systems can result in a 15% improvement in how patients view their experience at a healthcare facility. Introducing and actively using point-of-service payment collection processes can lead to a more efficient billing process and customer service satisfaction—two areas that can generate money and time savings. — Douglas Braun is president and CEO of Toledo, Ohio-based Internet Payment Exchange, Inc, a provider of electronic billing and payment technology solutions. • Do you capture sufficient patient and, when necessary, guarantor contact information during the point-of-service process? • Do you share a list of prices for treatments and services with patients? • If you are a part of a multifacility healthcare system, are you able to accept patient payments at any entity? • Can you accept nonpatient payments, such as equipment rental fees or class registration, as you would patient payments? • Can you convert check payments into an electronic transaction at point-of-service locations? • Do you have separation of duties for staff members who accept payments and reconcile payments? • Do you have measures in place to protect cash payments? • Are you promoting the collection of payments at the point of service to your staff and the general public?